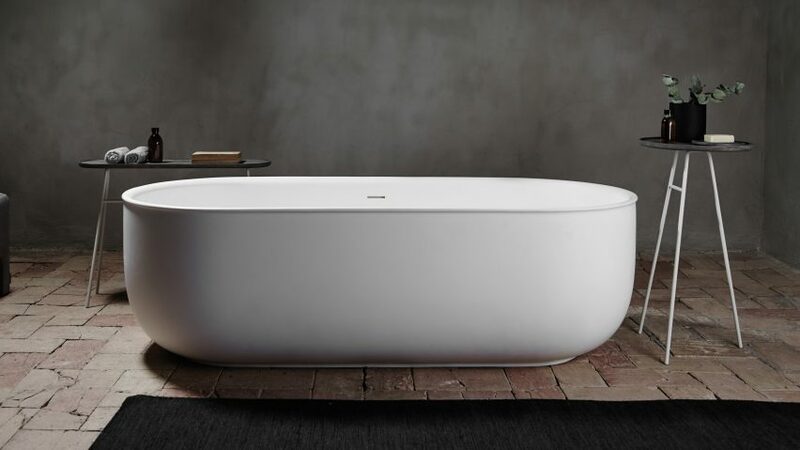 This minimal bathroom suite by Norm Architects is based on the shape of classic roll-top tubs. The Prime collection was designed by the Danish studio for Spanish brand Inbani. It features two bathtubs and a sink that are each a contemporary interpretation of their antique bathroom counterparts. Each piece has a bulging shape the designers say was inspired by the way "the pressure of water shapes an elastic material", such as a balloon. "This natural and recognisable shape of the designs, along with the soft rolled edge, makes the pieces extraordinarily appealing to the human eye, as well as inviting, familiar and modern at the same time," said the studio. Norm Architects was founded in 2008. Since then, the studio has completed a number of projects across interior, architecture and industrial design. It previously designed a range of minimal bathroom furniture for Ex.t and hacked IKEA flat-pack kitchens for Danish company Reform. More recently, it took influences from both Scandinavian and Japanese design to create a pared-back gallery and workspace for Kinfolk magazine in central Copenhagen and completed a contemporary farmhouse in the Suffolk countryside. Norm isn't the only architecture studio to venture into bathroom designs. Foster + Partners recently launched its first bathroom range for Porcelanosa, which was similarly minimal in style.